What are the requirements for using Biscuits & Bath? Does Biscuits & Bath require any vaccinations for my dog? Can my dog get injured in day care? Can my dog get sick in day care or overnight care? What happens if my dog bites another dog while at Biscuits & Bath? How does Overnight Care (boarding) work? Does my dog get a walk during Day Care or Overnight Care? Do you give water breaks to the dogs? Why should I socialize my dog? Does Biscuits & Bath breed discriminate? How do I get Webcam Access? Does Biscuits & Bath provide vet services? Does Biscuits & Bath provide training services? 1. What are the requirements for using Biscuits & Bath? In order to utilize our services, every client must complete a client and dog profile and read and sign our waiver. In addition, each dog must remain current with all vaccinations as required by the NYC Department of Health and wear an identification tag at all times. We also require that dogs are suitable for our unique environment including being safe with other dogs and our staff. We require these things of all dogs so that we can provide them with the best experience possible and so that you can know that we are doing all that we can to ensure the health and safety of your dog and our staff in the context of our cage-free and off-leash environment. For an overnight stay, please be aware our 24-hour care is priced on a 24-hour period. A pick-up after this period will incur a day care charge. Please note that unless otherwise noted in writing all services and products are non-refundable. For more information, please consult our Client Handbook or ask us any questions that you might have. 2. Does Biscuits & Bath require any vaccinations for my dog? We require that all dogs using any Biscuits & Bath service be currently vaccinated against rabies, distemper, hepatitis (adenovirus), parainfluenza, parvo and bordetella. That commonly means that you need the following vaccinations administered by a veterinarian: Rabies, DHPP, and Bordetella. In fact, all day care facilities in NYC that provide boarding, grooming or training services are required by law to have current vaccination records on file of all core vaccines for each dog that they serve as per the New York Health Department, Article 161.15. 3. Can my dog get injured in day care? While we make every effort to ensure that each dog in our care is as safe as possible, injuries can occur. If your dog is injured while in our care for any reason, and requires outside medical attention that our veterinarian partner, New York Veterinary Practice, cannot provide on-site, we will take your dog to one of the emergency pet hospitals in New York City for emergency and critical care. Our first priority will always be the care of your dog and therefore getting them to a top hospital quickly will be our first step. 4. Can my dog get sick in day care or overnight care? As in any day care facility, just like day care for kids, it is possible for even the healthiest dog to get sick in these environments. We do our best to avoid it by accepting only healthy dogs that are up to date on their vaccinations. In the event that a dog does get sick at one of our facilities, our on-site veterinary partners, New York Veterinary Practice, are prepared to treat any illness. 5. What happens if my dog bites another dog while at Biscuits & Bath? If your pet, while under Biscuits & Bath's care or supervision, bites another dog on the Biscuits & Bath's premises or under Biscuits & Bath's care or supervision, and such bite results in an injury that requires veterinary care, Biscuits & Bath will contact the owner of the bitten dog and upon written request of the bitten dog's owner, Biscuits & Bath will promptly divulge in writing (1) the name of your pet, (2) your name and contact information, (3) and any medical information necessary for the health and safety of the bitten pet. Under all circumstances, the health of your dog is our first priority and we will make every effort possible to make sure he or she is safe and receives the proper care. 6. How does Overnight Care (boarding) work? Our Dog Retreats are staffed 24 hours a day, 365 days a year to ensure constant supervision for your dog. All of our care is overseen by our full-time veterinarian partner, New York Veterinary Practice and our professional licensed dog trainers. We are able to accommodate a variety of length of stays. We can handle special feeding requirements and will be happy to administer oral or topical medications. We can also happily accommodate dogs of all ages from puppies to senior citizens as long as the dogs are friendly with other dogs. Our Overnight Care is priced on a 24-hour period. A pick-up after this period will incur an additional Overnight Care charge. Please note that our rates for Overnight Care are higher on the following federal holidays periods (typically Fri-Mon): New Year's Day, Martin Luther King Day, Presidents Day, Memorial Day, Independence Day, Labor Day, Columbus Day, Veteran's Day, Thanksgiving, Christmas Eve Day, Christmas Day, New Year's Eve Day. 7. Does my dog get a walk during Day Care or Overnight Care? We do not offer complimentary walks during these periods. We can provide a walk when requested for an additional charge. Walks range from 15-minutes up to one hour long. 8. Do you give water breaks to the dogs? We provide water breaks to all the dogs in our care. We normally separate each dog and provide water to them one at a time to assure they safely drink as much as they need. At rare occasions, when there are fewer dogs, we will leave a water bowl or two in the play area if none of the dogs are bowl aggressive or love to role the bowl over. 9. Why should I socialize my dog? Socialization is important for your dog's overall well-being. It will provide him with the confidence he needs to cope with new experiences in a positive way while reducing his anxiety and stress. 10. Does Biscuits & Bath breed discriminate? Biscuits & Bath does not discriminate by breed. We accept all non-aggressive dogs that are spayed or neutered and are up to date on their vaccines. We will however separate the dogs into the small and large play areas according to their size and/or temperament. Our professional groomers recommend having your dog groomed every 4-6 weeks to prevent matting, maintain a good coat, and avoid hygienic issues. All B&B appointments include a nail trim, ear cleaning, gland expression, and sanitary cut. Rest easy knowing your dog's appointment is backed by our Grooming Quality Guarantee™. 12. How do I get Webcam Access? Webcam access is a benefit provided to Gold and above members. Contact Us to gain access. 13. Does Biscuits & Bath provide vet services? Yes. Our on-site vet partner, NY Veterinary Practice, offers full service veterinary care with a focus on wellness and preventative care as well as surgical care exclusively at Biscuits & Bath. 14. 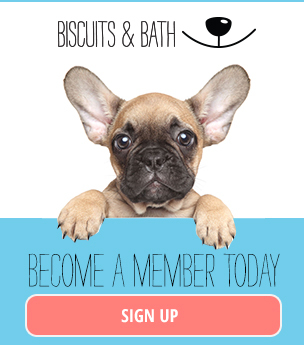 Does Biscuits & Bath provide training services? Yes. Our professional trainers are reliable, experienced and focused on providing the stimulation and structure necessary to make your dog a good companion. We cover a range of private lessons and group classes from puppy kindergarten to advanced training seasons.